Reward your child for being good this year by getting them a personalized certificate of recognization showing they are on Santas Nice list. 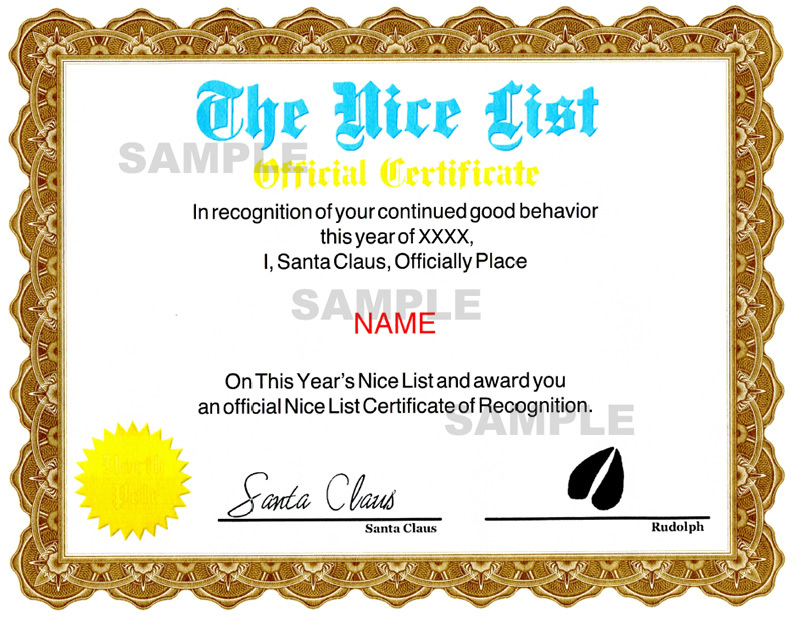 Choose a nice list certificate, personalize it, and order it in minutes. Your choice of CERTIFICATE design (see below) on 8 1/2" x 11" card paper stock. Envelope: Sent in a full size 9" x 12" envelope, with no folding. Authentic Christmas wax seal (not adhesive like some competitors). Click on a style of your choice below for a sample. GUARANTEE: All orders placed before December 16th are guaranteed delivery by December 24th. NOTE: We have received an update from USPS indicating that any orders placed after 16th will NOT be received until after December 24th, due to how back logged USPS is. Please be aware of this before purchasing any mail products. *note: If your order is placed by December 9th, the post office will place an official North Pole postmark on the envelope. If after, we will place our own stamped North Pole postmark on the envelope, but please be aware that after that date it will also include a postmark from our local post office as well.